Four of the six cantatas in this volume are written for soprano, treble recorder and basso continuo. The use of the treble recorder can be explained on the one hand by the general popularity of the instrument in that period, on the other hand by the fact that James Duke of Chandos (to whom this volume was dedicated) himself played the recorder. The cantata When Loves soft passion is based on a text by James Blackley. Obvious errors in the draft were corrected discreetly and the accidentals were adapted to modern practice. The original figuration as well as the joining beams over the quavers and semi-quavers were preserved. The few additions by the editor have been indicated. The recitatives should be performed with rhythmic freedom. Johann Christoph Pepusch was born in 1667 in Berlin and died 1752 in London. He received his first tuition in Germany and already at the age of fourteen a post at the Prussian court. Later he witnessed there the execution of an officer without trial, an arbitrary act that led him at the age of thirty to seek his home in another country, in a land whose political system was built on better principles. In 1704 he arrived in England, his further country of residence, where he became known first as a viola-player, then very soon as a composer, director of music, teacher of theory and as an organist. In 1713 he received from Oxford the title of Doctor of Music. Already by 1710 he had founded the Academy of Ancient Music in London, a body that was dedicated to the performance of and research into music of earlier periods, right back to Ancient Greece and Rome. 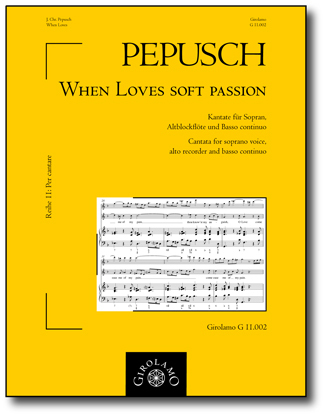 Pepusch became famous for his contribution to some of the pieces from the Beggars Opera. His most productive period was between 1710 and 1730, from which time a relatively large number of compositions have survived, particularly in printed form. He dedicated the last twenty years of his life increasingly to research in ancient music and to collecting old books and manuscripts. come ease of my pain. no longer Sigh in vain. or quit the Cruel fair. what alone can cure my smart. I’ll regain my wounded heart.